Drapal M, de Carvalho EBarros, Rouard M, Amah D, Sardos J, Van den Houwe I, Brown A, Roux N, Swennen R, Fraser PD. 2019. Metabolite profiling characterises chemotypes of Musa diploids and triploids at juvenile and pre-flowering growth stages. Scientific reports. 9:4657. Mabonga L, Pillay M. 2017. SCAR Marker for the A Genome of Bananas (Musa spp. L.) Supports Lack of Differentiation between the A and B Genomes. Journal of Agricultural Science. 9:64. Muiruri KSamwel, Britt A, Amugune NOnzere, Nguu E, Chan S, Tripathi L. 2017. Dominant allele phylogeny and constitutive sub-genome haplotype inference in bananas using mitochondrial and nuclear markers. Genome Biology and Evolution. Christelová P, De Langhe E, Hřibová E, Číżková J, Sardos J, Hušáková M, Sutanto A, Kepler AKay, Swennen R, Roux N. 2016. Molecular and cytological characterization of the global Musa germplasm collection provides insights into the treasure of banana diversity. Biodiversity and Conservation. 26:801. Olango TMagule, Tesfaye B, Pagnotta MAugusto, Pè MEnrico, Catellani M. 2015. Development of SSR markers and genetic diversity analysis in enset (Ensete ventricosum (Welw.) Cheesman), an orphan food security crop from Southern Ethiopia. BMC genetics. 16:1. Mahendhiran M, Ramirez-Prado JHumberto, Medrano RMaria Esco, Canto-Canché B, Tzec-Simá M, Grijalva-Arango R, James-Kay A. 2014. Single nucleotide polymorphisms in partial sequences of the gene encoding the large sub-units of ADP-glucose pyrophosphorylase within a representative collection of 10 Musa genotypes. Electronic Journal of Biotechnology. 17:137–147. Irish BM, Goenaga R, Rios C, Chavarria-Carvajal J, Ploetz R. 2013. 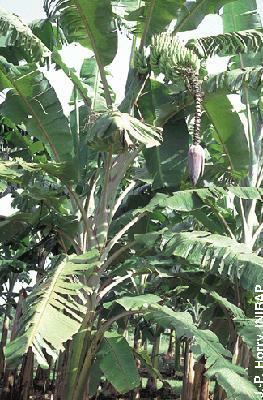 Evaluation of banana hybrids for tolerance to black leaf streak (Mycosphaerella fijiensis Morelet) in Puerto Rico. Crop Protection. 54:229–238. Volkaert H. 2011. Molecular Analysis Reveals Multiple Domestications of Edible Bananas. V International Symposium on Banana: ISHS-ProMusa Symposium on Global Perspectives on Asian Challenges 897. Till BJ, Jankowicz-Cieslak J, Sági L, Huynh OA, Utsushi H, Swennen R, Terauchi R, Mba C. 2010. Discovery of nucleotide polymorphisms in the Musa gene pool by Ecotilling.. Theor Appl Genet. 121(7):1381-9. De Langhe E, Hřibová E, Carpentier S, Doleżel J, Swennen R. 2010. Did backcrossing contribute to the origin of hybrid edible bananas? Annals of botany. 106:849–857. Risterucci A-M, Hippolyte I, Perrier X, Xia L, Caig V, Evers M, Huttner E, Kilian A, Glaszmann J-C. 2009. Development and assessment of Diversity Arrays Technology for high-throughput DNA analyses in Musa.. Theor Appl Genet. 119(6):1093-103. Boonruangrod R, Desai D, Fluch S, Berenyi M, Burg K. 2008. Identification of cytoplasmic ancestor gene-pools of Musa acuminata Colla and Musa balbisiana Colla and their hybrids by chloroplast and mitochondrial haplotyping. Theoretical and Applied Genetics. 118:43–55.